Download film Soal UKK Bahasa Inggris Kelas 5 Semester 2. Silahkan download Soal UKK Bahasa Inggris Kelas 5 Semester 2 secara gratis disini. Soal Berikut ini adalah contoh soal Latihan Ulangan Kenaikan Kelas V SD Mata pelajaran Bahasa Inggris yang terdiri dari pilihan ganda dan esay. silahkan didownload untuk bahan belajar anak atau murid anda. Semoga Soal ini dapat bermanfaat. This is Kidzone, the new playground in town. It is not real city. It is a city for kids aged 13-12. There is a bank, a school, a hospital, a shop , a zoo, and a bus station. There are buses, ambulances, cars and trains too. In this city children learn about the adult world. They learn how to buy, to sell, to work, and to get money from work. In kidzone, there are 70 different jobs. The children can try to be apolice officer, a bank teller, a fashion designer, a chef, a dancer, and many other jobs. Hurry come over and visit kidzone! 2. Is Kidzone a real city? 3. The Kidzone is a city for…. 4. How many different jobs are in the kidzone? 5. Have you ever gone to the Kidzone? II. Read and write, “yes” or “no”! III. Fill in the blank by the true answer! 4. …….. I go to the bathroom please? 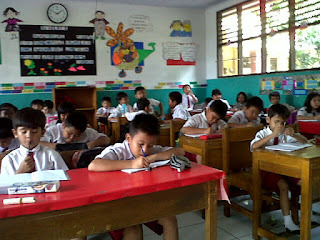 5. translate in to English language : saya suka nasitumpeng. 6. Mention the materials to make a kite! 7. The ingredients to make sweet brownies are…. 8. Mentions 5 public places! 9. Mentions 3 kinds of food and drinks! 10. How to make fried rice?